We are constantly working on the design of our products , improve navigation, try to make the interface intuitive and straightforward for inexperienced users. 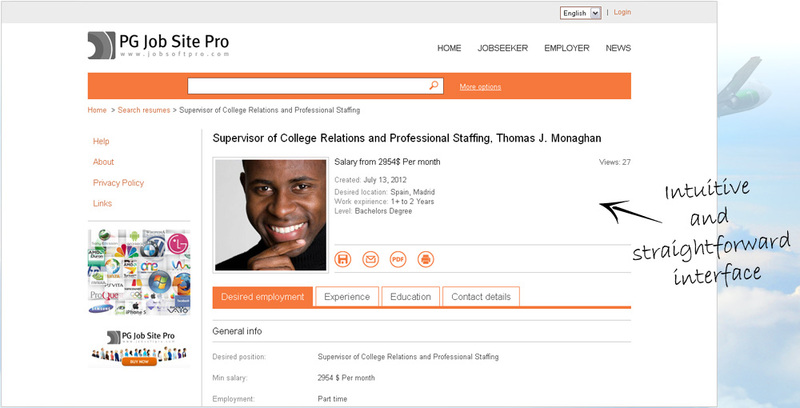 Enhance the job board site by using social networking widgets - Facebook, LinkedIn, Twitter, Google+ and Vkontakte. You can enable login with a popular site, allow comments and likes. PG Job Site Pro allows editing SEO tags (title, keywords and description) and URLs of site pages; view characteristics influencing search engine rankings; enable Google Analytics code; add restrictions to robots.txt file. All these options are available in the back-end. With polls administrator can conduct market researches and find out the level of satisfaction of its site members. It's possible to create target polls (for jobseekers, employers or all members), set a period for each poll, translate polls into all site languages, define start and expiration dates, set colors for polls.